Over the years, the brand of Blendtec continues to amaze health buffs and food experts for its functions, durability and design. 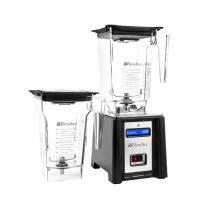 As a top of the line blender brand, Blendtec blender is built to outperform other commercial and home blender brands. Built with features that make it one of the smartest blenders, Blendtec blender gives you the versatility you want in cooking and food preparation. This quintessential kitchen appliance is, after all, not limited to making smoothies or cocktails. As such, the Blendtec blender can be used in more ways than one. There’s nothing quite like an ice cold frothy milkshake or a creamy, healthy smoothie to start your day perfectly right. These tasty treats can be made in an instant because the Blendtec blender crushes ice with ease. The ice is given a powerful grind and is crushed perfectly by the blender so that no ice chunks are left behind. Who said you have to head to commercial bars or join a wild party to satisfy your alcohol cravings? With Blendtec blender, you can have your favourite cocktail drinks created in your own kitchen. The good news is, this blending appliance enables you to blend alcohol and shaved ice to create a smooth drink with perfect consistency without wasting and exerting too much effort. Blendtec blender can also be used to create a bowl of salsa that’s flavourful, silky and smooth at the same time. A zesty but equally yummy salsa can be made using cilantro, onion, jalapeno pepper and lemon juice. Just put these ingredients into the Blendtec blender and witness your salsa made in an instant. Ice cream makers are extremely expensive. Without an ice cream maker, the process of making ice cream from scratch becomes more arduous. Worry no more. Blendtec allows you to make your favourite chilly dessert easier and simpler. Just place the ingredients in your Blendtec blender, press the ice cream setting button to activate the pre-programmed blending cycle to get that perfectly smooth and light consistency in your ice cream. There are so many different ways by which you can use your blender. Made from robust materials and engineered by international specialists in blending technology, the Blendtec blender can easily and perfectly perform its blending, chopping and liquefying functions in a matter of seconds. This means you don’t have to wait too long to taste the finished product. A reputation for high performance blending and durable lightweight design has always put the Blendtec brand ahead of its other competitors. Count on the leading Blendtec blender distributor in Singapore, Nature’s Glory, which carries the powerful Blendtec blender that is well worth your money. Contact Nature’s Glory to order the robust blender today!